PULLMAN, Wash. – For the first time, researchers have seen life rebounding in the world’s driest desert, demonstrating that it could also be lurking in the soils of Mars. Led by Washington State University planetary scientist Dirk Schulze-Makuch, an international team studied the driest corner of South America’s Atacama Desert, where decades pass without any rain. Scientists have long wondered whether microbes in the soil of this hyperarid environment, the most similar place on Earth to the Martian surface, are permanent residents or merely dying vestiges of life, blown in by the weather. In a new study published in the Proceedings of the National Academy of Sciences, Schulze-Makuch and his collaborators reveal that even the hyper-arid Atacama Desert can provide a habitable environment for microorganisms. The researchers found that specialized bacteria are able to live in the soil, going dormant for decades, without water and then reactivating and reproducing when it rains. When Schulze-Makuch and his collaborators went to the Atacama for the first time in 2015 to study how organisms survive in the soil of Earth’s driest environment, the craziest of things happened. After the extremely rare shower, the researchers detected an explosion of biological activity in the Atacama soil. They used sterilized spoons and other delicate instrumentation to scoop soil samples from various depths and then performed genomic analyses to identify the different microbial communities that were reproducing in the samples. The researchers found several indigenous species of microbial life that had adapted to live in the harsh environment. 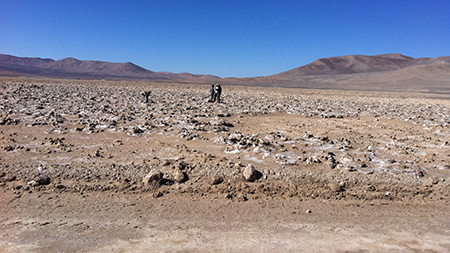 The researchers returned to the Atacama in 2016 and 2017 to follow up on their initial sampling and found that the same microbial communities in the soil were gradually reverting to a dormant state as the moisture went away. While life in the driest regions of Earth is tough, the Martian surface is an even harsher environment. It is akin to a drier and much colder version of the Atacama Desert. However it wasn’t always this way. Billions of years ago, Mars had small oceans and lakes where early lifeforms may have thrived. As the planet dried up and grew colder, these organisms could have evolved many of the adaptations lifeforms in the Atacama soil use to survive on Earth, Schulze-Makuch said. On March 15, Schulze-Makuch is returning to the Atacama for two weeks to investigate how the Atacama’s native inhabitants have adapted to survive. He said his research team also would like to look for lifeforms in the Don Juan Pond in Antarctica, a very shallow lake that is so salty it remains liquid even at temperatures as low as -58 degrees Fahrenheit. Dirk Schulze-Makuch, Adjunct Professor, School of the Environment, Washington State University, can be reached in Germany at 49-30-314-23736 or by email at dirksm@wsu.edu. Eric Sorensen, WSU News and Media Relations, 509-335-4846 or email at eric.sorensen@wsu.edu.